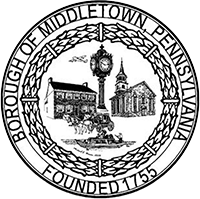 The mission of the Middletown Emergency Management Agency (EMA) is to provide for the safety and security of the citizens of Middletown Borough by preparing, implementing and exercising the Borough’s preparedness plan. To assure prompt, proper and effective discharge of basic borough responsibilities relating to civil defense and disaster preparedness, operations and recovery, the Middletown Emergency Management Agency is vested with authority and responsibility for emergency management, response and recovery planning within the territorial limits of the Borough of Middletown. The Middletown Emergency Management Agency’s Emergency Operations Center, located in Borough Hall, serves as the center of operations during an emergency to monitor and assess damage as well as deciding what agencies and resources will be needed to respond to the situation. After an emergency, the EMA works with other agencies and organizations to help the community recover from the crisis. More Information: For more information on how Middletown’s Emergency Management Agency operates, see Ordinance 1299 of 2013, which deals with Emergency Management. Stay indoors and dress warmly during the storm, Wearing layers of loose-fitting, lightweight, warm clothing will keep you warmer than one bulky sweater. Remove layers to avoid overheating perspiration and subsequent chill. Listen to a battery-power radio or television for updated emergency information, if the power goes out, you will still have access to important information. Keep the body replenish with fluids to prevent dehydration. Drink liquids such as warm broth or juices. Avoid caffeine and alcohol. Caffeine, a stimulant of hypothermia. Alcohol, such as brandy, is a depressant and hastens the effects on the body. Alcohol also slows circulation and can make you less aware of the effects of cold. Both caffeine and alcohol can cause dehydration. Conserve fuel. Winter storms last several days. Great demand may be placed on electric, gas, and other fuel distribution systems (fuel oil, propane, etc.) Suppliers of propane and fuel oil may not be able to replenish depleted supplies during severe weather. Electric and gas services may be temporarily disrupted when many people demand large amounts of the same time, Lower the thermostat to 65° F at night. Close off unused rooms, and stuff towels or rags in cracks under doors. Cover windows at night. Continue listening to local radio or television stations or a NOAA Weather Radio for update information and instructions. Access may be limited to some parts of the community, or roads may be blocked. Help a neighbor who may require special assistance infants, elderly people with disabilities. Elderly people and people with disabilities may require additional assistance. People who care for them or who have large families may need additions assistance in emergency situations. Follow forecasts and be prepared when venturing. Major winter storms are often followed by even colder conditions. Know your best route from home or work to a secure high ground in case of flooding in your area. Put together escape plan for all family members to follow in case of a flooding emergency. Determine what to do with your family pets in case of flooding. Make arrangements for them before flooding occurs. Make a list of valuables and keep it in a place that would not be affected by a potential flood. Keep important documents, such as passport, driver licenses, birth certificates, insurance paperwork, banking documents, etc. in one place that is easily accessible and can be collected and taken with you quickly in case of a flooding emergency. Prepare a supply of drinking water in closed, clean, plastic containers, not glass jars, Make sure you have at least one (1) gallon of water per person per day. Make sure you have at least three-day supply of non-perishable food that doesn’t need refrigeration or cooking and is compact and lightweight, such as: canned and ready to eat meat, fruit and vegetables, canned juices, trail mix, peanut butter, crackers, energy bar etc. Prepare two (2) first aid kits, one for your home and one for the car and include both prescription medication for you and your family members. By flashlights, a portable battery operated radio and batteries. Make sure your car gas tank is filled and store car emergency kit in the trunk. Monitor local media information and heed instructions from officials. Links below take you to Internet sites that are not under the management or control of the Borough of Middletown and is not governed by the privacy or security policies of the Borough. We have provided a link to this site because it has information or features that may be of interest to you. The Borough of Middletown does not necessarily endorse the views expressed, or the facts presented, on this site. Furthermore, the Borough of Middletown does not endorse any commercial products that may be advertised or available on this site.